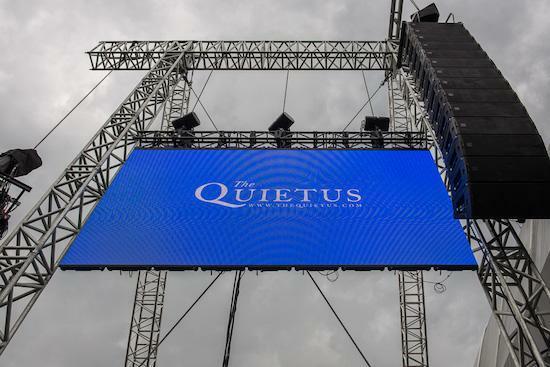 As Field Day 2017 draws nearer, the Quietus is once again proud to be partnering with the London festival for their main stage line-up. Ahead of the event, which this year takes place on Saturday June 3, we've rounded up our favourite interviews, reviews and opinion pieces on some of the acts set to grace Victoria Park this summer. You can get tickets and find out more about the festival here. "Despite the range of avatars he's used to present what he does, Richard D James' voice has always been unmediated. It's effortless, and innate. He found community in a wider musical realm, but he should also be understood in the context of the county that created him, and the way in which it resonates through his music. There is a Cornish language, which died out in the 1700s and these days is more of a hobbyist pursuit than a spoken vernacular. Richard D James' instrumental voice proposes his own unique Cornish language, one whose reflection of the landscape, its myths, beauty, violence, isolation, and weird traditions, is an uncanny Rosetta stone to this hugely misunderstood nation." "Love songs were always a big part of my life when I was young. But if you grow up with that, it gives you a pretty skewed and unrealistic idea of what to expect. So what I always wanted to do when I started Arab Strap – and this wasn't clear to me at the time; I can articulate these thoughts now much better than when I was young of course – was that I wanted to write love songs that were real. And that said things people actually said in real life. And not to poeticise the feelings and emotions too much." "Most of the track titles are named after very woodland and country-based things… you know, hill forts and that around the West Country. And our instruments, we consider them organic - a mono synth looks like something that could've grown out of a tree. And double bass… it's not like, laptops. It actually felt like they were very in tune together. It never felt like we were bringing computerised music to an outside environment." "The Pyramids listen to each other with almost as much intensity as the part that they are playing themselves; it requires the ability to hold back and add only a small amount to the overall piece as the musician sees fit at any given time. The musicianship here is self-aware but in a reflective rather than destructively fussy way." "Each song has its own personality and it is really like the business card of Imarhan in a way, to present ourselves for our debut album. So again, the music is based on assouf music, but with many other influences. Each song on the album has a specific topic and the lyrics speak about love, they speak about the Tuareg life, they speak about social issues for Tuaregs, they speak about issues for Tuaregs, but also just the normal life of Tuareg people and about the desert. And, of course, the nature." "For my whole life I've experienced a form of synaesthesia, like a crossing of senses. So I have a very visual experience when I'm making music or hearing sounds. And I sometimes get a very physical sensory reaction as well. So I wanted to really play with that and get a straight-through visual journey for people, of a motion ride through a futuristic jungle. As I get older I'm trying to utilise that sensory crossing." "The whole affair is somehow both grand and ramshackle at the same time, as though the band fell through a wormhole from a muggier parallel universe where every band releases an album each morning, take hits from the bong all afternoon and then stride out into their gently drifting gardens to play before crowds of infinite mass and colour in the evening. Take me with you King Gizzard And The Lizard Wizard, yours is the brightest of all alternate timelines." "Drawing together swaths of varying musical and political source material, Sirens seems to paint a bleak, and sometimes even surreal picture of the human condition. Its narrative, peppered with experiences from Jaar's own divided life, hints at an element of futility in the hope that humans can, even in our rapidly globalising world, overcome their racial and political differences." "This record shows that from darkness can come light, with the certainty of death there is also the continuation of life. Just as chapters end, so too new stories start. Pictish Trail has stepped out of the shadows of his past, as star in his own right, freed from the weight of what went before and buoyed by what lies ahead." "They acknowledge the hate and fear that has risen in the States, and - mere weeks into Trump's presidency when we're protesting his Muslim ban and other devastating policies - this record feels incredibly of the moment. It might not have as many thrilling moments as its predecessor, but it feels more important. There is rage, resistance and hope to cling onto on RTJ3, and now more than ever those things are necessary to keep ourselves afloat." "This is a collection of tapes I made off of a public radio broadcast about 20 years ago. I have no idea who the musicians are or what the credits should be. All I know is that Bela Bartok took the power of Beethoven and launched it into the 20th century with music that explores the very edges of ordered dissonance and harmonic tension without ever letting it break up into chaos. I don't understand any of this stuff, but damn I love it." "A band that have always seemed to be raging against the dying of some invisible light, Bay Area's finest, Thee Oh Sees have spent the last few years wielding inspiration, restlessness and hard work as an increasingly potent statement of intent. With a year-to-output ratio that would give Mark E Smith the fear, album number eighteen – An Odd Entrances – sees the garage rock juggernauts offer their most restrained proposition to date; one that explores compelling new territory by way of consciously taking a step, or several, back."